A beautifully sculpted composite origami art piece made from back-coated Khadi washi and pergamin. TRAN Trung Hieu, Hermit Crab. Leyla TORRES, Pre-Colombian Styled Frog Brooch. Benjamin John COLEMAN, Outcropping II (Origami Bonsai). Paper sculpture wall hanging. Origami flowers folded with handpainted paper, the tree trunk, branches, blades of grass made from recycled newspaper using a technique that the artist developed. Dust resistant coating adds to longevity of this wall mounted piece. “Rabbit Bride and Groom” now live! This intricate origami set was created by Korean folders nicknamed “Red Paper” and “White Paper” when they were guest presenters at the 2011 Pacific Coast OrigamiUSA Conference in Bellevue Washington. “Swan” by HOANG Tien Quyet now live for bidding! 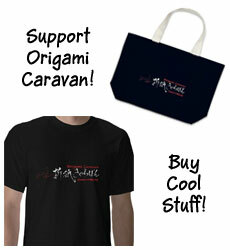 Origami Caravan auction. He said he folded this while contemplating the children orphaned in Japan’s 2011 earthquake / tsunami disaster. 2012 Spring Auction – Details! We’re pleased to announce the final details of the 2012 Spring Auction (which starts with our first auction this coming Saturday, 5 May, at 7PM EDT, US.) Once again, we’ll be using eBay as our auction venue, and require payment via PayPal – so if you’re interested in bidding, you’ll need to set up an eBay account, and either get a PayPal account, or use a credit card through their site. OrigamiUSA has kindly offered to be our official charity “sponsor” for our eBay auctions, and act as conduit for the financial transactions. Thanks to all the artists (and one book donor) for their generous donations – and we hope all our readers and fans will find something to tempt them to bid!